Minhaj University Lahore Admission 2019 are now announced for all the fresh students who have passed the intermediate and now wants to get higher education in MUL Lahore. This university is located in Lahore model town and other campus is in township Lahore. Minhaj University admission 2019 last date will be announced soon. Here you can get details of MUL Lahore admission 2019 advertisement is now posted here. Minhaj university Lahore provide quality education to the students in a very comfortable environment. Minhaj University Lahore provide basic facilities to the students like air conditioned classrooms, well trained staff, highly qualified faculty, lecture theater halls, canteen, transportation facility, library, hostel for students who are from other province or far away areas and play grounds are also in Minhaj university. 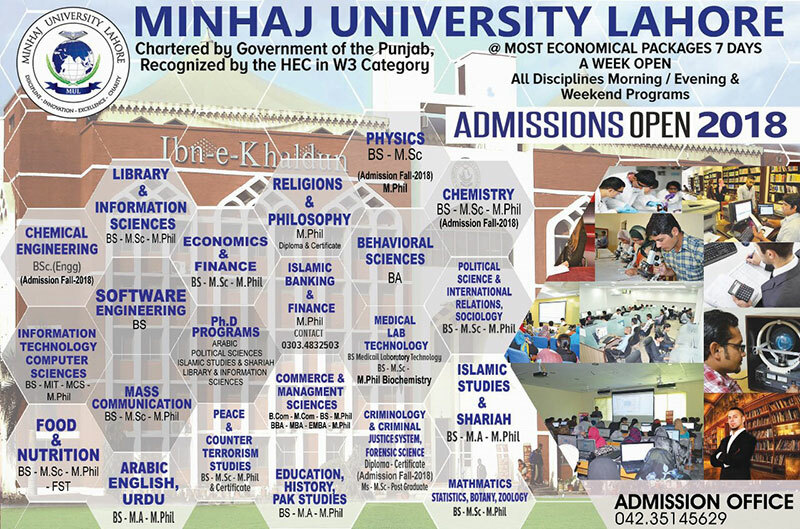 Minhaj University MUL Lahore is HEC ranked university and one of the top universities in Pakistan. MUL Admission 2019 in graduate, undergraduate, postgraduate, PhD and M.Phil programs are now open for all the candidates. All the students who have desire to take admission in Minhaj university can download admission form Minhaj university 2019 from official website of minhaj. Dr Muhammad Tahir ul Qadri is chairman of Minhaj university Lahore. His motto is to make every Pakistani educated. He said that most developed countries consume their most of GDP on education sector so that their young people can get education and take part in development of the country. In this regard university is providing the quality education to the people of Pakistan. There is only one college that is affiliated with Minhaj university Lahore and providing education only till intermediate. Moreover there is business and engineering school that gives education of their related programs. University Of Minhaj offers admission in undergraduate, postgraduate and PhD programs. Degree program List is as follows. To get admission in Minhaj University Lahore you should get your prospectus that contains admission form from university campus and fill the admission application form very carefully after that submit the admission form to the related department or admission office. You can get admission form prospectus by paying the admission form fee. You can also get your admission form from university website. NTS will conduct entry test for admission in Minhaj University lhr 2019 and gives admission to students on 100% merit. After entry test university officials will announce merit list 2019 Minhaj university Lahore 2019 Admissions. A Student get admission from the score of intermediate and entry test result. This university offers admission two times in one year so Minhaj University Lahore also announce admission twice a year. University officials decide which student is eligible for admission and they do this by scoring intermediate and entry test result both. Minhaj University admission 2019 form download is now available on university website. download from there and submit the admission form before last date ends. Admission form submitted after due date will not be accepted. Minhaj University is private university in Lahore announced admission in all departments. MUL is famous university in which every year thousands of students apply for admission. Higher education commission recognized in higher category as W-category. Here at webstudy.pk you can get all the details about Minhaj university Lahore admission 2019. Check online how to submit minhaj university admission form. Minnhaj University Lahore have also transport facility. Admission test complete schedule is given on Official Web of Minnhaj University Lahore. Note that all this information about Minhaj University Lahore admission 2019 is collected from different sources on internet but for authentic news and updates about MUL admission 2019 visit official website of minhaj university. 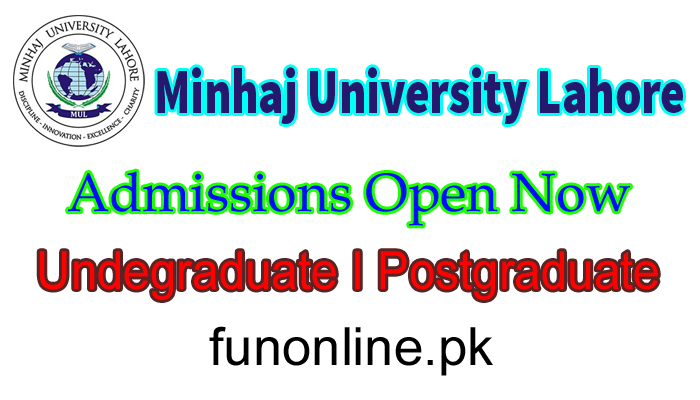 Here you can also get minhaj university Lahore spring admission 2019 details, mul Lahore fall admission 2019, minhaj university Lahore merit list 2019, minhaj university lhr fee structure and minhaj university Lahore entry test result 2019. If you wants to get admission in minhaj university then do it early before last date.